Why am I unable to capture as many stars as I can see with my eyes with my new DSLR? I have recently been given a Nikon D7000 as a gift. I have been trying to take pictures of stars on very clear nights. 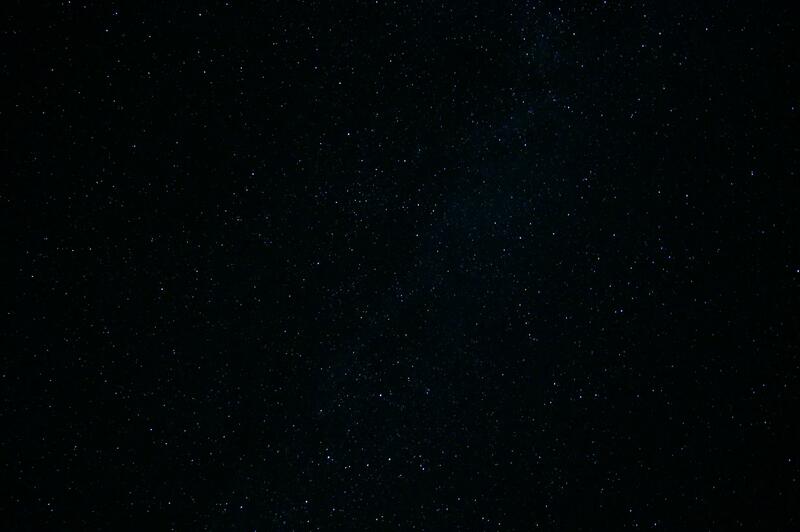 However, I am unable to make the camera capture many of the stars. My eyes seem to be able to see more stars than the camera, which with my past experience with worse cameras shouldn't be the case. I am using a 30 sec exposure, f/3.8 aperture, 1600 ISO, exposure delay on, 2 second timer, no VR and no zoom. Any ideas of what I could be doing wrong? Isn't the aperture large enough? Stars don't show up voluntarily on a photo. You need to tweak them a bit using photo editing tools on a computer. Best if you use RAW file format, and RAW-processing software to do this. JPEGs can be tweaked to show more stars, but with a lot less working room and result being of lesser quality. My exposure settings were 25 sec - f/4.0 - ISO 1600, almost the same as yours. At post processing the RAW image I used +1 exposure correction, increased contrast and adjusted brightness curve to turn the first image into the second. It would have been a lot better to expose more to begin with, but this shot is my first ever attempt at photographing stars. I've learned a bit since then. Those images are from my answer to "Capturing the Milky way, what did I do wrong?" question. Now, two things to pay attention to the next time you try it, up your ISO a bit, at least to 3200 or even 6400. And make sure your lens is in focus for the stars. Autofocus just don't make it, you have to do it manually with Focus Magnifying help in LiveView display. The Dynamic-range of the sensors of current digital camera is not yet a match for the dynamic range of human eye's sensor (aka retina). Better focus: at least, hard-focused to infinity. For that, you must set for "Manual focusing"
avoiding star trails: for that, check out this question: What is the "Rule of 600" in astrophotography? Post-processing: as Esa's answers pointed out. You need quite a bit post-processing. like tuning contrast, exposure, curves etc. as well as stacking etc. you need to make sure that your lens and sensor is completely clean aka dust-free and spot-free. In Nikon DLSRs, including the D7000, there is image-processing software that removes noise and hot pixels, and this software has come to be known as "the star eater" because it interprets isolated bright pixels as noise and removes them or averages them into the background. Isolated bright pixels, of course, are kind of what you want to see when you're photographing stars. Googling nikon "star eater" will turn up lots more information, but here's one place to start: http://nikonites.com/d7000/17053-removing-star-eater-feature-d7000.html#axzz2n67Hv36W . Digital cameras use sensors that actually have a fixed, intrinsic sensitivity to light. This means that as the total amount of incident light drops, so too does true exposure. Digital cameras get around this by adding configurable ISO levels, which simply boost the electronic signal generated by that incoming light by a certain amount. The only way to truly increase the strength of the signal is to let in more light...and the only way to let in more light is either with a longer exposure, or a larger aperture. Exposure can only go so far without tracking before stars start to "trail", so increasing the size of the aperture is the best option...if you have it. To maximize the signal level of your image, you need to use the highest ISO you can get away with. If ISO 1600 isn't producing decent results, then increase it to ISO 3200, or even higher if your camera supports it natively, and a higher level doesn't introduce too much read noise. For the most part, once a modern digital camera gets up to higher ISO levels, noise is dominated by photon shot noise, and read noise is minimal (less than 2-3e-). Regardless of which ISO setting you use, you will have to do further processing in post to maximize the results. You can either use some prodigious noise reduction in post, or you can try to take multiple frames and stack them using some kind of median averaging, to reduce the noise you see at high ISO. To demonstrate, here is a shot of the summer milky way. The first is the original shot, without any processing, where as the second has been processed. You'll notice the difference in contrast, color, saturation. etc. Faster lenses can be a huge bonus. You should try to find the sharpest f/2.8 or faster lenses possible for your astrophotography. Samyang lenses, which also sell under the name Rokinon and a number of others, have excellent sharpness from corner to corner, and have apertures as fast as f/1.4 for some of the more popular wide angles (14mm and 24mm, for example.) If you take your output size into account, you may be able to expose for longer as well. The images above were exposed for 30 sec. 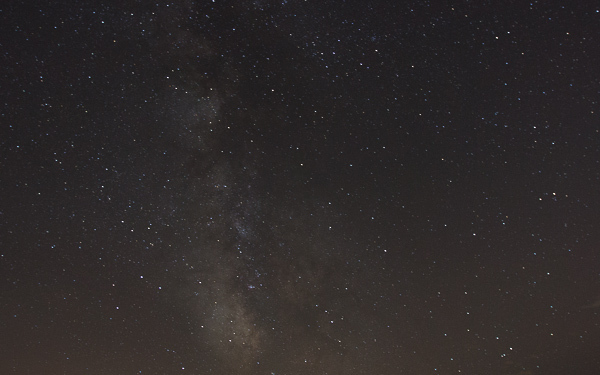 @ f/2.8 ISO 1600, and at full size, they exhibit a small amount of star trailing. Stars look like natural points of light scaled down for presentation here on the web, and I could have probably gotten away with 45-50 seconds or more worth of exposure time. If you only ever share your photos online at 1024 pixels wide, you might try exposing for longer, and not worry about the slight startrailing that occurs. Not the answer you're looking for? Browse other questions tagged dslr nikon-d7000 astrophotography stars image-stacking or ask your own question. Multiple copies of the same exposure, but randomizing the noise? Capturing the Milky Way: what did I do wrong? Why am I unable to disable automatic sensor cleaning on my Canon DSLR? 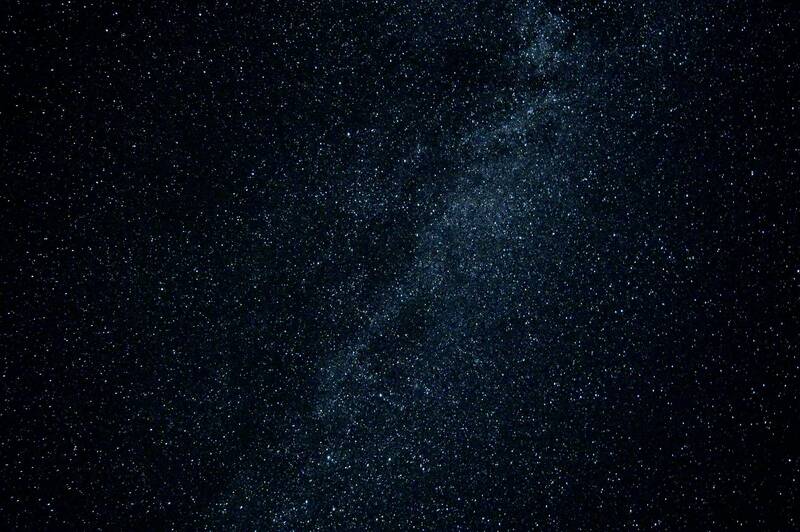 How to enhance a cameraphone photo so you can see stars? Why am I having trouble getting sharp results with my new DSLR, compared to a point and shoot? How can I capture an image like the stars over a landscape as in the Ubuntu Forever wallpaper? How can I make a telescope attachment for my DSLR to capture space images? What lenses can capture pictures of the moon, stars, and landscape best? Why are my photos of the moon blurry? Why do I see the moon as two objects through my DSLR viewfinder if I use eyeglasses?